During my formative period as a student and during my professional career as a Sthapati I had the good fortune of coming under the influence of two maharishis of world-wide reputation. During the early days of my boyhood, my father Sri Vaidyanatha Sthapati was working as the architect and builder of Sri Mathrubhuteswara temple at Sri Ramanasramam in Thiruvannamalai in 1939. This was the temple of the holy mother who gave birth to Bhagavan Ramana. I was around 13 when my father was building the temple and also making the holy image of Bhagavan Ramana in stone. The Maharishi scarcely spoke to devotees however devoted he was. But fortunately, He used to talk to my father whenever approached for advice on any issue. I used to stand by his side on such occasions. In the meantime, for the sake of my education, my father had to shift to Salem for the construction of a temple. There I did my SSLC and Intermediate in the local college. Yet my father and myself used to visit Maharishi, on work. During such visits I closely watched the face of Maharishi, always lustrous, whenever the talk turned on our family affairs and on me. He never enquired about my studies, but he used to look at me with a deep smile which I interpreted as a flow of grace. On one fine morning the results of the Intermediate Examination appeared in the papers. To our surprise, there was a call from the Maharishi to which my father and myself responded at once. All the time there was a large gathering of devotees in what is called Bhagavan's Hall. There was a newspaper in the hands of the Maharishi. Keeping both of us near his Yogasana, he spoke to the devotees with inestimable joy saying "Sthapati's son has passed the examination with distinction. His future is going to be very bright". We became dumbfounded. Not even a word of thanks could we utter. So much were we choked by joy. In response, we could do nothing but to prostrate before him and take silently His blessings. The next thing for my father to do was to send me to the Engineering College, Guindy, Madras. It was in 1947 that I applied and without any difficulty I got a seat, thanks to my high marks. But my father's dreams did not come true. Though my father was then a leading Sthapati in the field, he had no financial resources. The fee that I had to pay at the time of admission was only Rs.480/-. But for hostel and other expenses one had to pay around Rs. 300/- per mensem. This came in our way. This was too much for him as his monthly remuneration was only Rs.100/-. He was hesitant to take any decision for or against. Though he was poor he never approached anybody for financial help during his lifetime. His idea was to send me to the Engineering College and utilize the knowledge of modern science and technology for the better understanding of the Vastu tradition and work for its revival and promotion. Before he could take a decision, the date of admission expired and the whole family was upset. With stoic endurance my father kept silent for months. He never went even to the Maharishi for advice or help. A few months late, Maharishi called my father to his side and said "In your own native place, a college is established and it will start functioning from 15th August, 1947. I feel, it is only for him that the college is started late in the year". Taking Maharishi's words as a divine direction, my father lost no time to admit me there. Unfortunately it was not an Engineering College in the B.A. class taking Pure Mathematics as my special subject. The college was no other than Dr. Alagappa Chettiar College started in karaikudi on the first Independence Day. I was too young to understand that this turn of events would be for better and better suited for my career as a Sthapti later. We believed in the words of Maharishi and took the journey along the path he directed. Only after I took up Sthapatiship I realised the values of Maharishi's direction. I am happy to say that it is because of his blessing that I am what I am today. The world around me knows today to what extent I have fulfilled my father's dream. I am proud to say that I have gone up several steps ahead of my father's expectation. This is because of another Maharishis's intervention and direction that I was blessed with career as Sthapati. And that Maharishi, under whose influence I came next, is His Holiness paramacharyal of Kanchi. I had to leave the position of a Sthapati that I was enjoying under the Palaniandavar Devasthanam, Palani in 1961 and assume the principalship of the School of Sculpture and Architecture, a position my father had held from 1957 to 1960. My father had to retire as he fell seriously ill. He had a severe stroke followed by paralytic attack and was unable to speak. Even expert medical treatment was of no use. Finally I took him to Pillaiyarpatti (near Karaikudi) for Ayurvedic treatment, on the advice of Sri S.Ganesan "Kamban Adippodi", who was my godfather since my early days. Even this Ayurvedic treatment produced no results. It was around this time in 1963 I met Paramacharyal when he was camping at llayattankudi, a village about 10miles from Pillaiyarpatti where I was born. I had never met him before, though my father had known him intimately for many years. The intimacy between Paramacharyal and my father was at its all high when he was commissioned for building a stone mandapam in the premises of Kanchi Mutt. This is the mandapam where pujas are performed today. The interaction was so intense and frequent that my father was able to present an effective and comprehensive picture of the divine tradition of Vastu and Shilpa and requested Him to move the society to realize the values of the tradition as also for its revival and development. Of course, the Government of Tamil Nadu had already started a school for the revival and promotion of art and architecture. My father was the first Principal. It was enough for the revival of skill and expertise. But what my father wanted Paramacharyal to do was to create a social awareness as to the spirituality of the tradition and take it as a mission. Every Friday he used to visit Kanchipuram on work inspection and had serious and series of dialogues with paramacharyal on Vastu and Agama traditions. 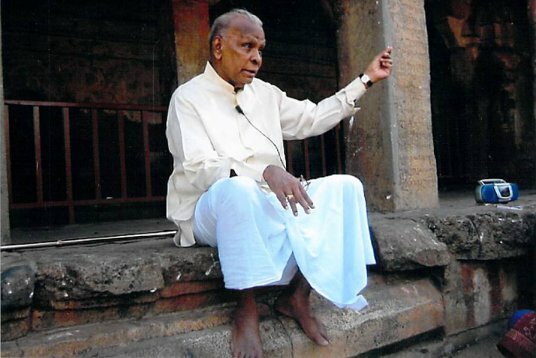 My father was not merely a Sthapati with normal hereditary knowledge of Vastu and Agamas, but was an expert in Tamil and Sanskrit, sculpture and architecture, astronomy and astrology, Vedas and Upanishads, Mantra Sastras, and Tantra Sastras, musicologist and himself a musician with abundant practice in playing upon Gottuvadyam. So he found it easy to impress upon His Holiness how these arts were spiritual and how they were meant for the spiritual welfare of the human race. Paramacharyal was very much impressed and touched by all these. He was sad to find that a divine tradition of this character and calibre should lie low in the social hierarchy. This is the seed that my father sowed in the fertile heart of Paramacharyal which later on sprouted into a movement at llayattankudi where he ushered in Sadas called "VEDA AGAMA SHILPA VIDVAT SADAS". This movement has worked wonders later on. It helped to reanchor the spiritual message of the Vastu Vedic Culture in the soil of it birth. Let me now turn to my father and his illness. Having lost all hopes of redeeming my father from the dreadful disease, I ran to llayattankudi and told Paramacharyal of his plight. He was in the midst of a large gathering of devotees and philanthropists of Chettinadu. On hearing that the Sthapati was on the sick bed, he emerged out of the gathering and took me away from the place asking me to walk with him. The crowd was following but we were moving away from it, the Acharyal enquiring not about my father but about my education, employment and also my ambition in life. I did not like this. I was much worried, because he did not enquire about my father's illness and offer remedial advice. Further, I did not go to him for anything personal. I was in Government service with a well-defined future. Finally, far from the crowd, there was a lonely temple built over a Samadhi into which he entered leaving me behind at the threshold. He did not ask me to come inside, nor to stay outside. It was 10 O'clock in the night. The crowd also waited till midnight and melted away, but I was standing all alone in the precincts of the Samadhi. I waited patiently for his return and blessings and advice and then to take leave of Him. It looked as though it were a test whether I persisted or ran away with distrust. I was very much afraid to remain there all alone as it was 12.30 at dead of night. It was the Samadhi temple, an Adhisthana of another Acharyal. A kind of fear gripped me as the clock moved to 1.00 a.m. I was hungry too. At about this time he emerged out of the temple calling me "Where is that boy?" "Here I am", I said. He beckoned me to His side and took me to the corner of the temple prakara and then started his enquiry about my father. Hearing me for 15 minutes, he gave me a couple of broken coconuts (he walked with me empty-handed and wherefrom he got the broken coconuts, still I do not know) and blessed me saying 'You would prosper and be happy". But not a word about my father. He repeatedly said that I would be happy. I interpreted this expression of Paramacharyal as bad for my father and something good for my future. My father passed away after a few months. One important event that I experienced when I left Paramacharyal, at midnight, from the Samadhi temple was something strange and unaccountable. While blessing me with "Akshatas" he showed me also the way to the heart of the village. There was none to accompany me. I was full of fear and very hungry too. To my surprise I saw a boy of eight years with a fair complexion and with a tuft (kudumi) on his head asking me to follow him. He looked like Adi Sankara of 8 years old, exactly as picturised by artist Gopulu in one of Kalki's Deepavali Special Number. Wherefrom that boy came at that hour, what for and on whose instruction, I could not know. Silently I followed him till I reached the camping site of paramacharyal. The boy then took me to the Manager into whose ears he whispered something. The Manager asked me to sign a receipt and take the money he gave. I refused politely saying that I did not go to Paramacharyal for financial help but for blessings alone. He insisted with some kind of authority which I could not resist. The unknown boy disappeared into the outside darkness. Still I believe that it is Sankara who led me from darkness to the well-lit camp of Paramacharyal. And yet another surprise was in store for me. I was offered good food at that unusual hour. My hunger subsided and I went to sleep in the camp site. It was only after this, in 1965, Paramacharyal conducted the Veda Agama Shilpa Vidvat Sadas. I was asked to take a leading role in the Shilpa Sadas, though there were a number of senior and experienced Sthapatis assembled for the Sadas. I was asked to speak on "Sthapati and his contribution to Indian culture and civilization" by Paramacharyal. His idea in asking an youngster to speak about the tradition while more experienced Sthapatis were then available, was not only to encourage the younger generation but he believed that the younger generation of shilpis was the future hope for the spiritual culture of the Vastu tradition to flower again. I took this as such and endeavored to live up to the expectation. Whenever there was a difficult problem, he advised the clients only to approach me, thereby influencing me to keep myself thorough with the problems of Shilpa Shastras. This encouragement qualified me to become a more useful member of my clan. And if at all I have some insights in the hoary tradition of Vastu Veda, it is only because of this indirect direction he gave me during the formative period of my Sthapati profession. I owe much to paramacharyal and I bow to Him, with folded hands.